On this first Saturday of July, our community is happy to announce the entry of a new postulant: Dylan Shogren, from Brisbane, having completed his aspirancy, now joins James and Israel in the ranks of the postulants. On the vigil of St John the Baptist, we were pleased to welcome Israel De Brito as a postulant. Israel who is a professional wine-maker from Perth arrived before Easter and now joins James Morrison in the group of postulants. He is in charge of our new hens and geese, as well as of the garden. Please keep him in your prayers as he moves forward towards noviciate. And here come the "ladies"! Here's presenting the most recent arrivals at the priory: Henrietta and her 19 companions! In the photo, aspirant Israel shows the first egg! Queensland comes through once again! The noviciate of Notre Dame Priory now counts six novices, half of whom hail from Queensland, thanks to the latest addition in the person of Brother Maximilian Mary (Dominic Swan) who was clothed last evening in the presence of his mother, a brother, two sisters, and a number of friends who were able to make it in spite of bad weather around the Apple Isle. Here are a few shots. Fr Prior's exhortation for the event will be found under the "From the Prior" button. The community has a new postulant. This afternoon before First Vespers of the Ascension, Father Prior welcomed as postulant James Morrison, who is originally from Auckland, New Zealand. We wish him every blessing as he sets out on this new path in community under the auspices of the feast of our Lord's glorification at the right hand of the Eternal Father. Last weekend Father Prior was invited to hold a Lenten recollection at Blessed John Henry Newman Parish in Caulfield. The event was well attended and sparked renewed interest in our community. 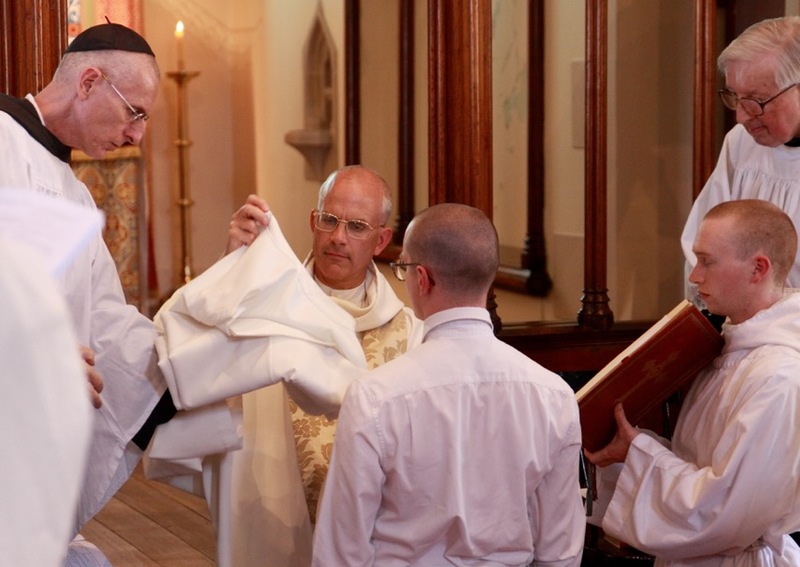 Father Prior offered two solemn Masses, one last Saturday and one last Sunday. Here he is shown with the parish priest, Fr Glen Tattersall. Chant practice with renowned director of Vox Clamantis, Iaan-Eik Tulvé. Archbishop Porteous with Fr Prior and Fr John from Flavigny. Last Sunday, in between two retreats, Fr Prior, accompanied by Fr John from Flavigny, and three of our novices, made a double pilgrimage to Sydney. First to the tomb of St Mary of the Cross, secondary patroness of our community. The monks spent a good amount of time in prayer there, asking her protection and guidance in establishing their presence in the land she loved so much and sacrificed herself for. They then went to St Mary's Cathedral where they prayed at the tomb of Archbishop Bede Polding, whose dream of bringing Benedictine Monasticism to Australia we hope to continue in some small way. Before leaving the cathedral, we chanted the office of None in the crypt. The first retreat held under the auspices of Notre Priory since its foundation was concluded today. 36 men were present for the event. A 3 day women’s retreat will start on Monday. Northern Isle, here we come! Father Prior, accompanied by three of the novices, left Tasmania yesterday for the "northern isle" to hold the community's first retreat mission since its foundation. They are currently at Hartzer Park Retreat Centre in Burradoo where they have a group of nearly 40 men making the Spiritual Exericises. We were honoured to have with us for a few days Jaan-Eik Tulvé, director of the Estonian ensemble Vox Clamantis. Jaan-Eik, whom Fr Prior got to know in Flavigny where he directed the St Joseph CD, is in Australia at the moment with his singers giving concerts in Melbourne and Sydney. Jaan-Eik has a profound knowledge of Gregorian Chant which he has studied for many years, and his approach has been a tremendous help to the novices, introducing them to aspects of the chant that you won't find in books. One of the big advantages of the move to Rhyndaston is Colebrook church. Here are a couple shots of our Christmas Matins and midnight Mass. Well, things are finally starting to look a bit more "normal" in our new priory, Bethlehem. It's been a week since our official move. In that time, the solemn celebration of Christmas being excepted (see following post), our efforts have gone into making the new setting as close as possible to what a monastery should be. Here are some shots of the move and the places.